I know, this might be blasphemy, but I really hate it when policies are pushed down that require that all aspects of online learning are made accessible. I honestly think that these policies actually make online learning less accessible because they are written or enacted in ways that convenience easy measurement of compliance rather than actually looking at the intention behind the requirements. It goes back to the equality versus equity question. Equality is giving the same thing to everyone, regardless of their needs. The Merriam-Webster definition of equality is “the quality or state of being equal”. The problem is that learners are not all equal. They do not all have equal needs. This is exactly what blanket accessibility polices do. Equity has much more of a social justice tone to it. The definition of equity from Merriam-Webster is “fairness or justice in the way people are treated”. The goal of equity is to ensure that everyone gets what they need. In the context of learning, it means providing the same information using multiple forms of representation. This, by the way, aligns with the principles of Universal Design for Learning (UDL). A good accessibility policy would be one that required instructors to provide content using multiple representations, such that all learners could access the best representation to suit their needs. For example, information provided in infographic format for visual learners, and then paragraph format for those who need to see the text. The accessibility requirement says that I need describe the infographic – however, the attempt at description often involves describing the characteristics of the image (e.g. pie chart with three sections). The paragraph description of the content is accessible to screen readers and provides the information in narrative format. It doesn’t make sense to be required to describe the image. If the same information is provided in multiple formats, then the intention of the accessibility requirements are met. Unfortunately, intention is not something that can be easily interpreted, measured, or automatically checked. Intention doesn’t translate well to policy. So, instead we get requirements that our courses need to be run through some form of automated accessibility checker and we are flagged if we not all the elements of the course pass. I hate accessibility rules because it means we waste a lot of time creating descriptions and transcripts and such, when we should be spending that time designing multiple forms of representation. 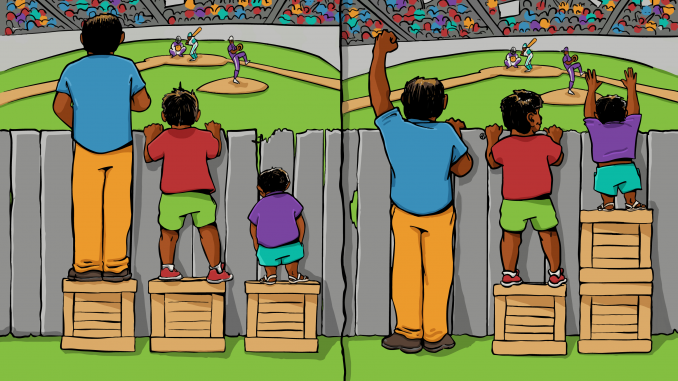 We end up wasting time trying to ensure equality at the cost of equity. Feature image by Interaction Institute for Social Change | Artist: Angus Maguire.